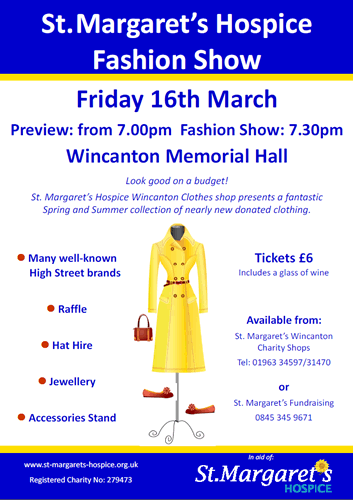 Staff and volunteers of the St Margaret's Hospice Charity shop will showcase their wonderful collection of Spring and Summer outfits during a Fashion Show in the Memorial Hall on Friday 16th March. It will be a fantastic evening. All the models are amateur, and fairly brave to volunteer themselves for the catwalk. They love working to raise funds for St Margaret's and are willing to model because they believe in the value of the wonderful free palliative care given by St Margaret's clinical staff to local people. They would like to show the outfits to a hall full of interested people, who may also be tempted to buy the outfits during the course of the evening. Tickets are £6 and include a glass of wine to welcome you to the evening. They are available from either of the shops, 01963 34597/31470 or from the fundraising office 0845 345 9671. The show commences at 7.00pm, with a preview to tempt you, so arrive as early as possible.